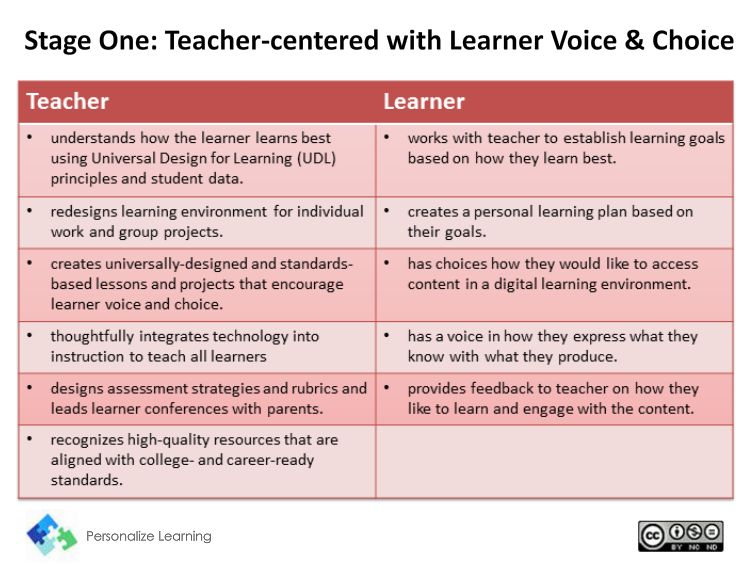 Over the past several months I've been doing an online course with Barbara Bray and Kathleen McClaskey entitled "The 5 W's of Personalized Learning" (the W's are what, who, where, why and wow). 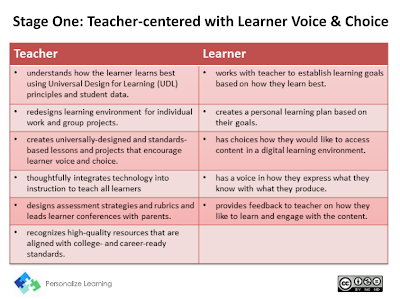 The final module of this course asks us to create a presentation about personalized learning explaining why it is important to transform education. 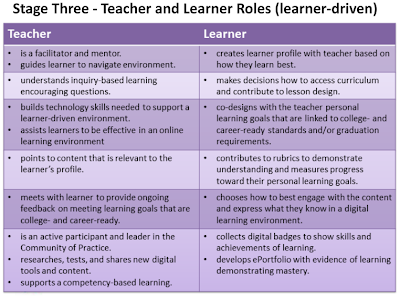 I've been thinking about this in the light of working in the PYP programme, and about how inquiry plays a role in the different stages that schools can go through as they move from teacher-centred to learner-driven education. I have looked at this stage from the perspective of a homeroom teacher planning a unit of inquiry, which at ASB happens as part of grade level collaborative planning with myself and the PYP Coordinator. There is a focus on standards and on how technology will be integrated. I am also aware that students do set goals for their own learning. Sometimes students have a voice in how they express what they know and what they produce, but often everyone in the class is expected to make the same kind of presentation. From a PYP perspective Stage One corresponds quite closely with what we call teacher-directed inquiry, as teachers come up with the questions that address the lines of inquiry for each unit. Students do have voice and choice in that we encourage student questions and give them many opportunities for sharing their thoughts and wonderings. However the focus of the unit is not really on the students' questions if they don't match up with the pre-determined learning outcomes. During the course of the unit, some of these questions will naturally be discussed and answered, but they will not be the focus of the inquiry. 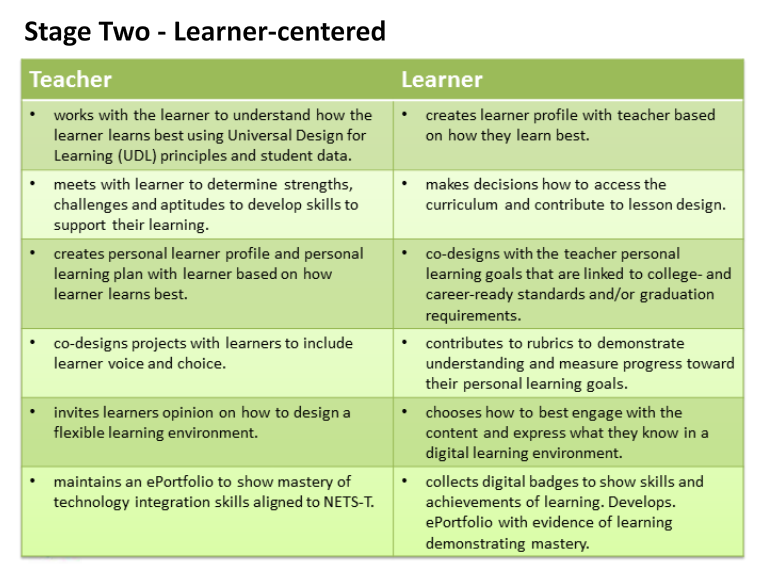 The second stage in moving towards personalized learning is learner-centred. 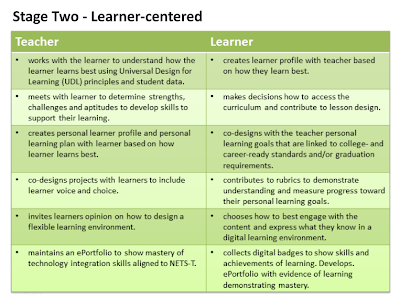 Again Barbara and Kathleen provided a graphic about what this looks like for the teacher and the learner. As I reflect on this, I see that ASB is working towards many of these. In some grade levels there has definitely been a dialogue with students about the design of a flexible learning space, and I think some teachers have started to ask for student input into the design of the rubrics. All students from Grade 1 upwards to maintain an ePortfolio with evidence of their learning, though we do not yet use digital badges. Teachers are not required to maintain an ePortfolio showing tech integration linked to the NETS-Ts but we have had tech meetings with each grade where we have discussed these standards. Looking at this through the lens of the PYP, this stage would be one of teacher guided inquiry, where the students' questions are seen as more important and are combined with the teacher questions to decide the direction of the inquiry. Students would work in groups based on their curiosities about the unit, and would come up with two or three broad questions that the group as a whole could investigate. Students themselves would discuss how to go about answering the questions. In teacher guided inquiry, students would have input into how their understanding of the central idea of the unit would be assessed; they would also create their own rubrics so that they could assess what it is important for them to know, understand and do. The summative assessment of the central idea could be the same for all students, but the way they demonstrate their understanding may be very different for each group or for individual students. At ASB there are a couple of units of inquiry where I've seen evidence of this type of student voice and choice. 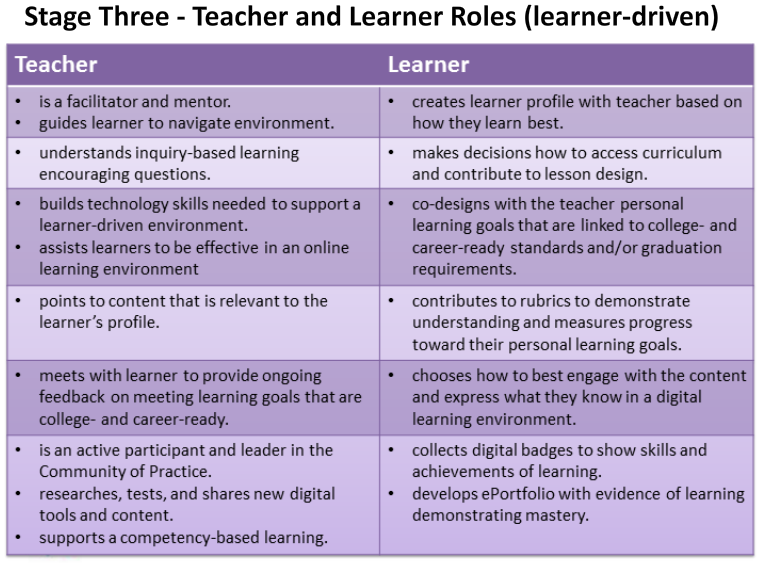 The third stage of personalized learning is learner-driven with the teacher as a facilitator and mentor. Looking at this from the PYP perspective, this stage would be characterized by independent inquiry. In this case the central idea would be the same for all students, but individual students could come up with additional central ideas for their own inquiry. In Stage Three students are also working collaboratively to decide how to organize and carry out their investigations, how they will show their understandings and how they will be assessed. They mange their time and decide what resources they will need. At ASB we are most likely to see teacher guided inquiry during PYP Exhibition, Independent Studies, the Curiosity Project and the 20% time that some teachers give their students. In the PYP Exhibition teachers throughout the school act as mentors to groups of students, they meet them regularly to discuss their progress and can suggest modifications or improvements. The students themselves are more involved in self- and peer- assessment. We also have teachers who meet with individual high achieving students throughout the school to help them set goals and to mentor them on personal projects that they are engaged in. For example we have a Grade 5 teacher who meets regularly with a Grade 1 student who is interested in producing digital art and publishing his own eBook. I was interested to see that at this stage the teacher is responsible for building his or her technology skills to support the learner and to assist them as they work in an online environment. 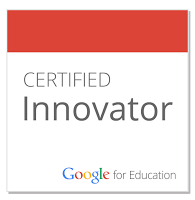 This points to personalized PD for the teachers and the importance of the role of the tech coordinators in providing this. At ASB we are currently conducting a tech audit with the hope of being able to provide such personalized PD to our teachers next year. In addition, many teachers on the school's R&D core team do research, test and share different approaches to learning. I feel that I have a lot of material already that I can put into the presentation for my online learning course. My experience of Independent Studies, the Curiosity Project and the PYP Exhibition is that students are very motivated once they are in Stage Three of the personalized learning model. Currently we are mostly at the first stage, but with many initiatives going in in separate parts of the school in the other two stages as well. I'm confident that with the right support, teachers can move forward with our goal of personalizing learning for all students. Excellent article. I'm a high school science teacher myself. I find it very relevant!